There are some Science-Fiction television series you either know or you don’t: there is no in-between. 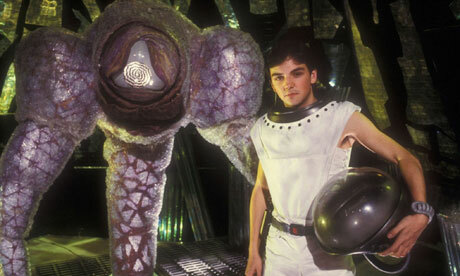 And the BBC’s strange mid-1980s show ‘The Tripods’ is definitely that. Shown just once, in the years of first broadcast, and never seen since outside of a handful of late home entertainment releases, it is obscure enough to qualify as cult viewing but almost forgotten enough to qualify as a test of one’s cult knowledge. Which is perhaps why so many uber-geeks hold it in such regard. Based upon a series of post-apocalyptic books for adolescents by John Christopher (nom de plume of British author Samuel Youd), it represented a real attempt by the BBC to produce a quality Sci-Fi show with some cutting edge special effects. Unfortunately the reality of British TV drama budgets in the decade of red braces and shoulder pads meant that the resulting effects were neither cutting edge or particularly special (though admittedly not as ropey as some contemporary ‘Doctor Who’ episodes). The storyline, taking some liberties with the source materials, followed the adventures of Will Parker, a rebellious youth in a late 21st century Earth, where Humanity is living in quiescent servitude under the rule of huge alien machines called the Tripods, their subservience the result of special headgear or ‘cap’ fitted to boys and girls at adolescence. Hearing legends of ‘uncapped’ humans in the south, Will and his cousin Henry set off on a journey to find them, while being pursued by their Tripod overlords and their human collaborators, the Black Guard, eventually entering the City of the Tripods where Will becomes a servant to one of the alien masters. Running for just two seasons of thirteen and twelve episodes respectively, loosely equating to the two first books of the original trilogy, the series was cancelled by the then rigidly anti-Sci-Fi BBC boss Michael Grade (‘Doctor Who’ was his next target resulting in an 18 month long hiatus for the program). Though popular with viewers, and some critics, ‘The Tripods’ was never to return, the already scripted third season, like the final episodes of Joss Whedon’s ‘Firefly’ (2002), remaining one of the great what-ifs of television Science-Fiction. Despite its age, and the limited nature of its special effects, ‘The Tripods’ has aged surprisingly well. Like some old episodes of classic ‘Doctor Who’ or the original ‘Battlestar Galactica’ the quality of the acting and writing, combined with imaginative use of the scant resources available to the program makes, make for some enjoyable viewing (the Tripods themselves are still quiet impressive). If not as legendary or worthy of praise as some Sci-Fi shows it is certainly better acted and shot than many others regarded as exemplars of the genre and more than worth a look, especially for those, like me, who saw it the first time around. ‘The Tripods’ is available in a rather nice recent boxed edition and, as always, there are rumours of a soon-to-be-made movie version – but don’t hold your breath just yet.